The Honda Civic Sports that we saw for the first time during the Auto Expo 2008 is here finally. The Honda Civic Sports is primarily about looks. And it really looks good as you can see from the photo here. I will try to get more photos of the Civic Sports soon. If you ignore the looks which are an improvement on the normal Honda Civic, you are left with pretty much nothing though. All those who were hoping for a 150 or 170 bhp Honda Civic Sport will be disappointed. The price in Delhi is 12.36 lakh ex-showroom. That is pretty acceptable for almost anyone who has been planning a Civic purchase. So go for it, whats a few thousands here and there! I am not sure about the color options. 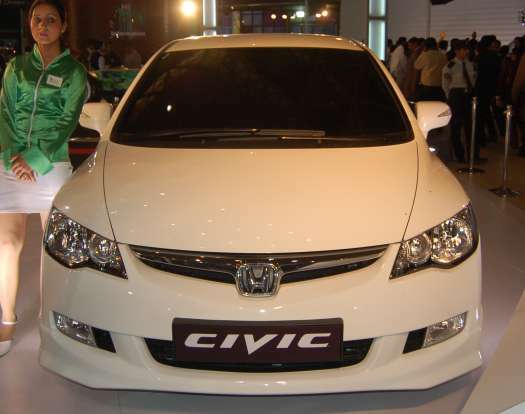 The Civic Sport on display at Auto Expo 2008 was in white, and the ones I have seen at dealers are white too. Even the Honda India website talks about white alloy wheels. So is white the only color option? If anyone knows for sure, do let the readers know in the comments. Okay, that does not sound like much. But believe me, just the spoilers add so much to the look of the Civic. It is not a look that matches up to the Type R design, but it is close. Do the new skirts added to the car make it more likely that the car would have even less ground clearance and would touch even more potholes? Well, yes. Unfortunately. On bad roads, I would always advise caution in the Civic. And in the Civic Sport, make that extra caution. It is not an SX4, a fact you would remember every time you go around a corner – and there are compromises to be made. But is the lesser ground clearance a deal-breaker? No. Just be careful.